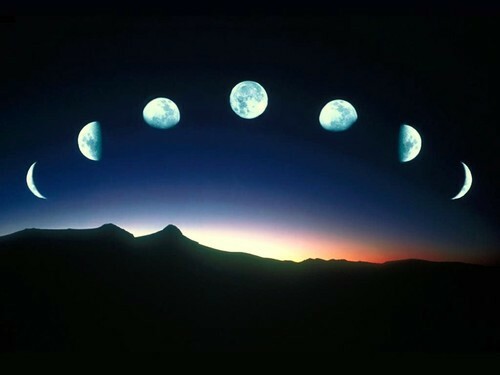 Phases of the Moon (Chandra) over a lunar month: 13 "moonths" in a year (13x28=364). For karma, the Buddha taught the observance of virtue over yoga's Chandra Namaskar. Getting ready for meditation (MRY). Lunar observance (uposatha) days are times of renewed dedication to the practice of the Dharma -- the Buddha's Teaching on gaining enlightenment and bringing about the end of all suffering (nirvana) -- observed by lay Buddhists and monastics throughout the Theravada Buddhist world. These are days of more intensive reflection and meditation for monastics and intensive practitioners. In many monasteries physical labor (repairs, construction projects, etc.) is curtailed. Practice sila on lunar observance days. On full moon and new moon days, the fortnightly recitation of the Patimokkha (monastic rules of conduct) along with its requisite confession of lapses takes place. 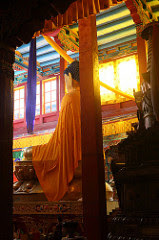 Lay Buddhist observe the Eight Precepts on these days -- instead of the customary Five Precepts undertaken at other times -- to support meditation practice and to re-energize the commitment to live in accordance with the Dharma. Whenever possible, lay people use these days as an opportunity to visit the local monastic complex to make special offerings to the Monastic Sangha, to listen to the Buddha's Dharma, and to practice meditation with Dharma-companions late into the night, sometimes until morning. For those without a local monastery, it can simply be an opportunity to step up efforts in meditation (for which Ten Precepts are most useful), while drawing on the energetic support of millions of practicing Buddhists around the world. Gentle Hatha Yoga stretches prepare the body for joyful sitting meditation (mairam.lt). The Calendar of Lunar Observance (Uposatha) Days is calculated using a complex traditional formula that is roughly based on the lunar calendar. (See local temple for exact dates of observance). The result is that the dates do not always coincide with their actual astronomical dates. It further complicates matters that each sect within Theravada Buddhism tends to follow a slightly different calendar (across countries and communities).